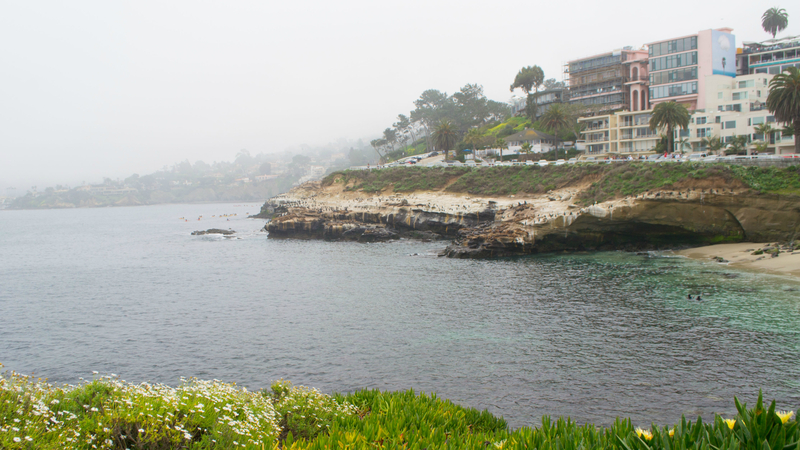 La Jolla Cove on a cloudy day. Photo from Wikimedia Commons. A low pressure system moving across the region will bring cool weather and occasional rain showers in most areas of San Diego County Monday through Tuesday and gusty winds in the mountains and deserts into Wednesday. Scattered showers are expected during the morning hours in areas other than the deserts, but the possibility of rainfall will decrease Monday afternoon through Tuesday morning, then cease altogether, according to the National Weather Service. “Occasional light showers will continue along and west of the mountains through early Tuesday with greatest coverage during the night and morning hours with less this afternoon,” according to the weather service. The trough of low pressure is also expected to bring gusty winds to the mountains and deserts. Although gusts of up to 40 miles per hour are in Monday’s forecast for the mountains and 45-mile per hour gusts are expected in the deserts, a wind advisory for the areas will not take effect until 6 p.m. Tuesday. During the advisory period from 6 p.m. Tuesday to 8 a.m. Wednesday, winds of 25 to 35 mph with gusts of up to 55 mph will be possible, forecasters said. The winds may cause problems for drivers, especially those operating high-profile vehicles, and could kick up sand and dust in the deserts, according to the weather service. Motorists are urged to use extra caution.